Many people are somewhat intimidated by their doctors. You might consciously or subconsciously feel that the doctor is better educated and therefore more knowledgeable about your health than you are. In reality, you know more about your health than even the best doctor could. You may not know what is causing that pain you are experiencing, what that rash on your arm is called, or what your overall clinical diagnosis is. But you know how you feel, and the only way your physician can know that is if you tell them, and if they hear, understand, and believe what you are saying. There are many things your doctor could do or not do, or say or not say, that may make you want to find a new doctor. These things may be different for each person and situation. Here are a few things you can look out for. You do not feel that your doctor is listening to you. Does your doctor look at you when you are speaking? When you tell your doctor how you are feeling, do they comment or ask questions? If the answer to these two questions is no, then your doctor probably is not listening to you. You do not feel that your doctor believes you. It's not difficult to tell whether your doctor believes what you are saying to them. The physician may acknowledge that you've said something, but may not comment on it. There will be no tests ordered and no treatment given. Your doctor cuts you off when you are speaking. This means they are not getting the full information you have to give. It also suggests your doctor is trying to rush through the appointment. You feel rushed when you are with your doctor. Typically, appointments are scheduled 15 minutes apart or less. Your doctor may talk fast and move fast, and give you a sense of urgency. You feel that your doctor acts superior to you. If you feel your doctor is smarter or more important than you are, you might not feel you have the right to demand the health care you deserve. Your doctor insults you, instead of treating you. This almost goes hand in hand with your doctor thinking you are less than you are. For example, ifyou have suddenly gained a lot of weight, but your eating and exercise habits have not changed, you should be worried. If you tell your doctor this, and without asking any questions or performing any tests, they conclude that you are fat because you eat too much, you've just been insulted. You know something is wrong, but your doctor fails to order tests or refer you to a specialist. This may mean they aren't listening to you, don't believe you, or simply don't understand what you are saying. They may know so little about your complaint, that they are unsure what they should do or say, and therefore do nothing. This could put your life in danger. While there are many reasons for wanting a new doctor, you do not need a specific reason for changing doctors. You may not be able to pinpoint why you want to switch to a new physician, but if you feel like you want to make a change, the reason does not matter. 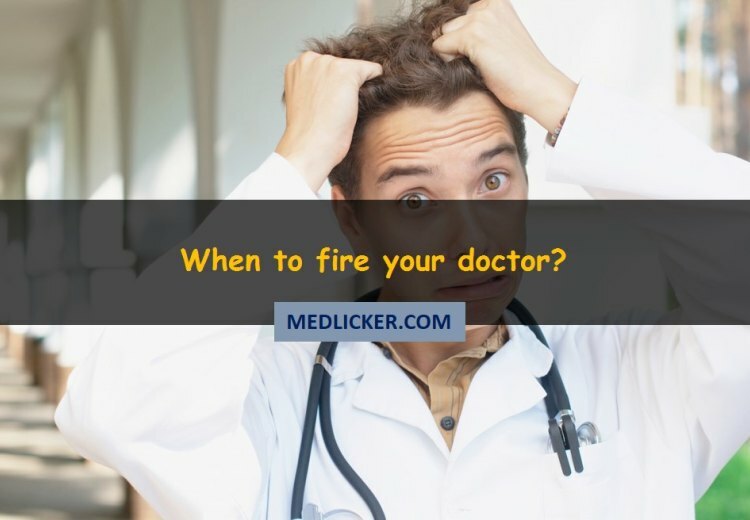 When is the right time to fire your doctor? If your doctor is retiring or has died, this is not an issue, but when you want to change doctors, it is essential to fire your doctor at the right time. First, you should line up a replacement. This is true for family doctors as well as specialists; you should try to avoid not having a doctor to call on. Take the time that you need to learn about the doctors in your area; make sure the one you choose is accepting new patients and that the practice accepts your insurance. The next step is to sign a release for your medical records or to obtain the records yourself. Doctors' offices can often be slow when it comes to transferring medical records to a different practice. The best method, if you can afford it, is to get the records yourself. Although you will be charged for the copies, you will have your own set of records, which your new doctor can copy. Once you have found a new doctor, and that doctor has your medical records, you will ready to fire your old doctor. You do not have to do or say anything in order to fire your doctor; you just get a new doctor and transfer your medical records. But in some cases, you may want to fire your doctor in person, over the phone, in a letter, or in an email. You may feel a need to confront your old doctor because they have angered you or failed you in some way. Before you make that appointment or call, or write that letter or email, have a cooling-off period of at least two to three weeks. Think about what you want to say; make notes if you need to. If you want your old doctor to fully understand (and learn from) your decision to find a new doctor, your words must be delivered in a clear and concise manner. Be prepared to lay out all of the facts, and clearly tell the physician what they have or have not done that compelled you to find a new doctor. Additionally, if your doctor has truly crossed a professional or ethical line, you may want to report their actions to the medical board in your state. You never have to feel bad or guilty about finding a new doctor and firing your old one. You must do what is best for your health. Just be sure, before you make a change, that doing so will not be detrimental to your health.